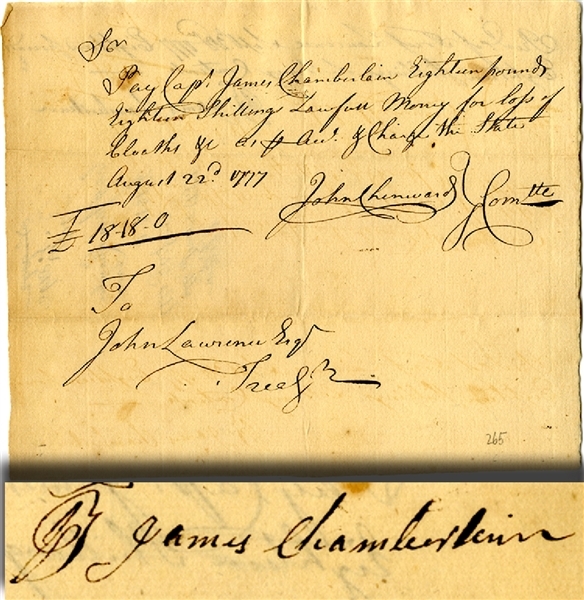 War-date Autograph Document Signed “John Chenward” as member of the committe, 1pp. small quarto, August 22, 1777, addressed to John Lawrence, instructing him to pay Capt. James Chamberlain for “loss of clothes.” Signed by Chamberlain on verso. Fine condition. Capt. James Chamberlain, in his day one of the best known and most respected men in the Colony and State of Connecticut. He came to Tolland from Coventry, about 1772, and removed to Warehouse Point before 1782. During the Revolutionary War he had commanded a cavalry militia company during one or two tours of duty, and was a representative in the assembly at the October session of 1775.